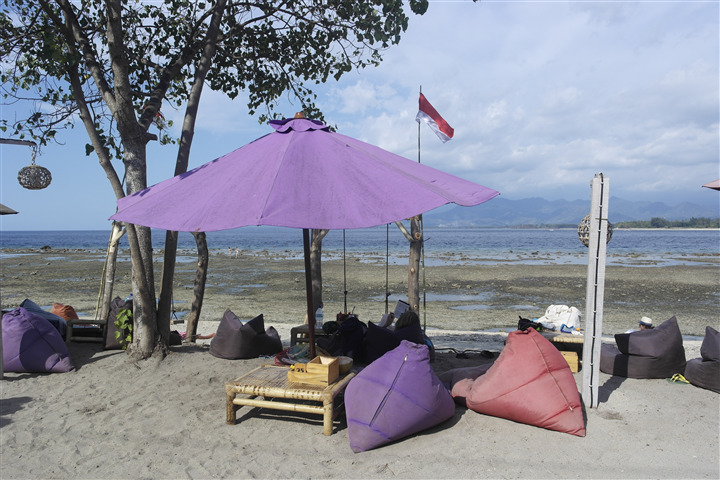 We decide to visit one of the famous Gili Islands, east of Bali. Therefore we purchase a combo ticket bus + ferry directly to the hostel. We leave Ubud at 7 am and we reach the port of Padangbai at 9 am. Here it is really crazy: people everywhere who do not know where to go and dozens of different ferries. We are already regretting this choice. The Gili Islands are an archipelago of 3 small islands: Gili Trawangan, Gili Meno and Gili Air to the northwest of the coast of Lombok. The first one is famous for the nightlife, the second one for romantic couples and finally, the third one seems to be in the middle. That's why we choose the latter: Gili Air. We finally manage to get on our ferry and reach the island at 2 pm! We pay about 15 euros per person for the whole trip. There are also faster ferries at a higher cost. If you have a limited time available, it is better to opt for the quicker one so you will avoid stopping at each island to wait for passengers to come down or get on the boat. Once on the island, we look for a hostel, here called homestay. More than a hostel, they are a sort of private rooms within the homes of a local family. They are quite cheap with a simple bed, a small bathroom and even electricity. We stay at the Kholis homestay for about 6 euros per person, including breakfast. It is easy to find accommodation even if you do not have a reservation. You just need to adapt to it a little bit, as always. Afterwards, we make a tour of the island walking all around, given its small size. During the afternoon there is low tide, so the sea withdraws leaving space to the rocks below and you can barely get into the water. We, therefore, enjoy the relaxed atmosphere and the good reggae music that animates the whole island. In the homestay, we meet a nice Australian lady who knows very well the island and she recommends us a little local warung that has delicious food. Here we have a Nasi Campur, that is rice with sauteed vegetables, accompanied by an excellent natural juice. All for less than 2 euros. The next morning we wake up at 7 am to enjoy the first light of the sun and the magical silence of the island still devoid of tourists. So we decide to take another walk of about 1 hour and a half. The colours of the sea are spectacular, with the sun gently shining on it. We meet only someone running on the beach and the atmosphere is really peaceful. After this nice awakening, we return to the homestay to have breakfast and then we go to the local ticket office to buy the ferry ticket to Kuta Lombok. We pay 12 euros for a ferry of about 20 minutes + a shuttle bus of about 3 hours from the port to Kuta Lombok. While waiting for the ferry, we enjoy this fabulous sea and relax on the white sand. We stay on the island only 1 night and a little less than two days. In our opinion, it is more than enough to savour this paradise without being too involved in the mass tourism that is slowly devouring the island. We, therefore, prefer to venture towards the nearby island of Lombok (http://www.marsontheroad.com/en/destinazioni/46/tra-surf-natura-e-tradizioni-lombok).